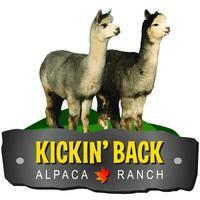 Kickin' Back Alpaca Ranch is a farm located in Markdale, Ontario owned by Doug & Carolyn Lilleyman. We're glad that you found us on the web. Please take a look at our sales lists and enjoy learning more about our farm. We welcome your inquiries and questions! We believe we can breed greys with lingering fineness, density, crimp and correct conformation. Our goal is that each generation will be better than the previous and in time to have a herd of elite grey alpacas. We have taken advantage of every chance available to us to learn about alpacas. We have attended three Education Weekends sponsored by Alpaca Ontario, two shearing courses, several fibre courses and Camelidynamics Handling course. We pride ourselves on Customer Service. Each client is dealt with personally; we want to sell you what is right for you. We will provide support before and after your purchase. You will be provided with complete records on your new alpaca. Our commitment to you doesn’t end with the sale - it is just the beginning. Most of our alpacas are both Canadian (CLAA) and American (ARI) registered. Come see what all the excitement with alpacas is about. We have an open barn twice a year. This year the summer Open Barn and Country Market will be held July 28, 2018 from 10 am to 3 pm. Our next Open Barn will be in December. Please check out our Blog and Facebook page for a list of all the vendors that will be attending this year. 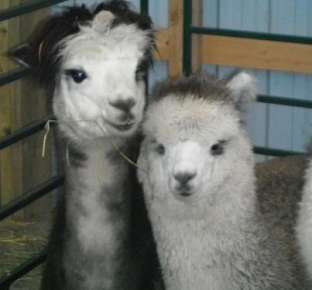 For the comfort of our alpacas we ask that you please do not bring dogs to the farm. We also do family farm visits for $20.00 by appointment, please contact us to reserve your personal time. For larger groups please contact us for rates. While you are here stop by our farm store to see all of the wonderful products we make from the fibre we harvest every year. Debit and credit cards are accepted.